In the early years of the government of King Henry II, he had relied on his mother, the Empress Matilda, for advice on many different matters. As she grew older, Matilda’s health declined, she became more pious and her influence over her son waned as he gained greater experience as a monarch. Regarding church matters, Henry and his archbishop of Canterbury, Theobald, had a good working relationship. Theobald had an experienced cadre of clerks working for him, many of whom made their way into the king’s administration, including Thomas Becket. Henry eventually appointed Becket Chancellor, the most important position in England. 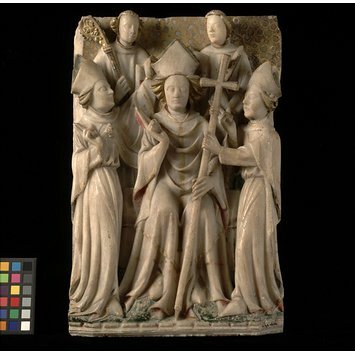 Becket accompanied King Henry to Normandy several times on business and Matilda, who had made her primary residence in Rouen, may have met him there. Matilda knew Becket had a reputation for enriching himself and for living a life of luxury. He was also a pluralist, meaning he held more than one church office. Matilda disapproved of the practice of pluralism. When Archbishop Theobald died in 1161, Henry decided his best friend Thomas would be the man to become the new archbishop of Canterbury and felt he would cooperate with him on church matters. Matilda made it clear she did not approve of the appointment but Henry ignored her advice. Becket was consecrated as Archbishop of Canterbury in June of 1162 but there was trouble immediately between him and the king with Becket putting the interests of the church ahead of the Crown. Thus began many long years of conflict. The main sticking point for Henry was his determination to limit the powers of the Church courts in England which he felt endangered the legal powers of the Crown. During the quarrels, Becket did nothing to ingratiate himself with Matilda. In October of 1164, without permission, Becket fled into exile in France and began plotting against the king. There were many attempts to reconcile the archbishop and the king and Matilda did whatever was in her power to help in the early stages of the dispute, even going so far to help maintain some of the men who went into exile with Becket. Becket’s friends believed Matilda was a friend of the church, supported church reform and had some influence over her son. By the same token, Henry was interested in maintaining his mother’s backing for his stand in the matter. Matilda may or may not have been intent on a reconciliation between her son and Becket. But being the diplomat she was, she made an effort. A direct appeal from Pope Alexander III prompted Matilda to write the following letter to Becket in 1165. Matilda would not countenance any reduction in royal dignity or authority, in essence fully backing her son. She remained true to her personal convictions. Politically she could do nothing to influence events. 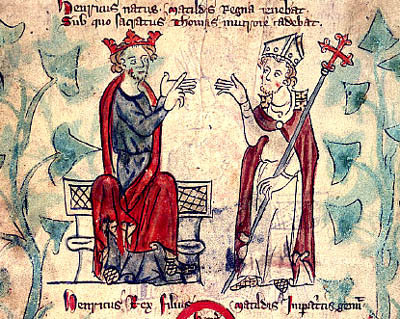 In actuality, the breech in relations between Henry and Becket had the effect of reducing Matilda’s influence with her son even further. Matilda would not live to see the denouement of these events. She died on September 10, 1167. 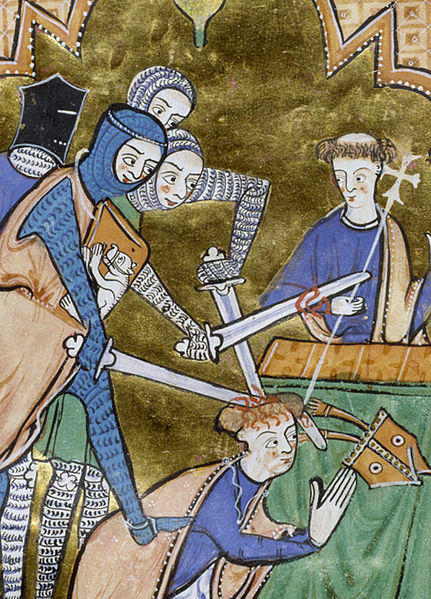 Thomas Becket, Archbishop of Canterbury was murdered by four of King Henry’s knights in Canterbury Cathedral on December 29, 1170. Thank you Susan, very interesting article. I also had the impression the Empress faded away. Glad she did not. Same as Queen Alienor who did not fade, but actually flourished after husband Henry died. Just knowing she (at age 80) crossed the Pyrenees in the middle of winter to fetch her grand-daughter for the French Dauphin tells about her strength and determination. Hi Andrew, The book referenced at the end of this article gave the following source for the letter: Bouquet’s “Recueil Des Historiens de la France, vol. xvi, p. 235, Latin. Wood, vol.i, letter iv. This is an ideal way for me to read historical articles – concise and interesting. Thank you. Love this letter. Medieval “say sorry and mean it”. I don’t know why, possibly because Henry II has always seemed to be so strong-willed, but I’ve always assumed that Matilda simply retired to France and let him get on with it. It’s interesting to learn that she was still fighting for him even after she’d attained her life’s goal of getting him crowned. Yes April. She was working behind the scenes to help Henry with good advice. After reading this letter, it reinforces my belief that Mathilda received “bad press” when she was in England. Thank you for this wonderful article. It was very easy to read for my old eyes and to understand to boot. I can not describe the joy your articles have brought into my life. Again, thank you for all of your hard work.